Philadelphia Comic Con: Batman, Buffy and … Bath Fitter? 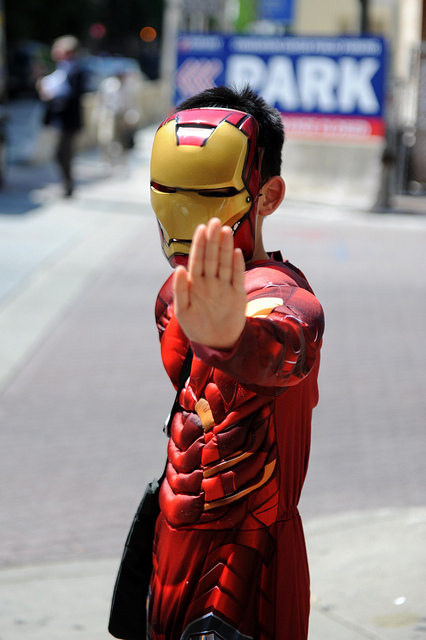 Pop culture conventions can offer insight into the latest entertainment craze as well as emerging trends in marketing. Kendall Whitehouse, Knowledge@Wharton’s technology and media editor, covers the evolving landscape of entertainment and popular culture. He recently attended Wizard World Philadelphia Comic Con and filed this report. This past weekend’s pop culture convention in Philadelphia — officially known as Wizard World Philadelphia Comic Con — included a broad array of activities for fans of science fiction, horror and fantasy. The show also highlighted the increasingly fuzzy line between pop culture fandom and broad marketing outreach — as evidenced by the eclectic assortment of businesses hawking their wares to attendees. Some regional comic cons concentrate on comic books, harkening back to the halcyon days of the early shows before they were focused on movies, television, and celebrity appearances. In contrast, the Philadelphia Wizard World event — one of nine sponsored by Wizard World around the U.S. — more closely follows the pattern of the large annual pop culture extravaganzas in San Diego hosted by the non-profit Comic-Con International, and in New York run by the ReedPop division of Reed Elsevier. This weekend, the exhibition hall in the Pennsylvania Convention Center was filled with vendors of comic books, original artwork, movie posters, T-shirts and costume accessories. In Artist Alley, comic book creators displayed their artwork and chatted with fans. Panel sessions included discussions with pop culture aficionados and celebrities. While there were a few panel sessions centered on comic books, many of the larger panels focused on cult television shows such as AMC TV’s popular “The Walking Dead” and two former Joss Whedon TV series, “Buffy the Vampire Slayer” and the short-lived fan favorite “Firefly.” In contrast to San Diego Comic-Con’s longstanding tradition of showing exclusive clips and “sizzle reels” of forthcoming blockbusters, movie screenings at Wizard World Philly took a nostalgic look back at the late-1980s and early-1990s with Andrew McCarthy appearing at a screening of Weekend at Bernie’s and Lauren Holly hosting a showing of Dumb and Dumber. There were also abundant opportunities for autograph signings and celebrity photo ops where, for a modest fee, fans could obtain a memento of their moment with a favorite actor or pop culture icon such as WWE wrestler John Cena. A costumed fan. Photo by Kendall Whitehouse. And, of course, it wouldn’t be a comic con without “cosplay” — fans who stroll around the conventions and pose for photos arrayed as their favorite comic book, TV or movie characters, from Batman and Robin to blood-drenched zombies. One frequently-voiced criticism of the larger comic cons is their “Hollywoodization” – the growing emphasis on movies and television rather than comic books. Yet, movies have played a role at San Diego Comic-Con since the 1970s, including the world premiere of The Golden Voyage of Sinbad in 1974 and a pre-release presentation on Star Wars in 1976. Given the movie industry’s increasing reliance on comic book properties — from D.C. Comics’ Batman to Marvel’s The Avengers — the con’s expansion to embrace the full range of popular culture is hardly surprising. In a world awash in media crossovers, the focus is, appropriately, on the content rather than the medium. Yet, some recent comic cons show signs of expanding well beyond the traditional realms of pop culture content. 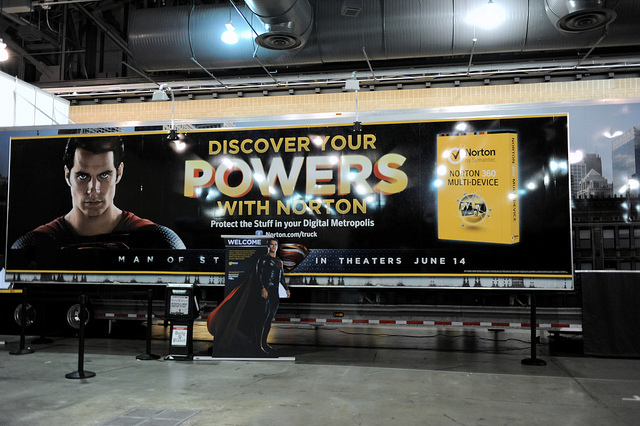 As Knowledge@Wharton previously noted [see “Consumer Brands Go Geek at Comic Con“], Chevrolet and Craftsman Tools were conspicuous at Reed-Elsevier’s New York Comic Con last October. Despite their dubious connection to the pop culture universe, both firms worked to ally their products with the geek zeitgeist, with Craftsman handing out a comic book in which the Craftsman Technician saves the Justice League with the help of the company’s Bolt-On tool system. On the show floor at the Wizard World Philadelphia Comic Con, the array of exhibitors stretched further beyond the usual realms of sci-fi, horror and fantasy entertainment. Symantec and Superman. Photo by Kendall Whitehouse. A bit farther afield were the Rohto “cooling eye drops” being dispensed at the show. But, here again, perhaps the bleary-eyed crowd could use some eye relief after hours of video games and movie marathons. Stranger still was the table for “Readings by Brandy,” offering “palm and tarot readings” and the ability to “answer all life questions” — including, presumably, why it made sense to have a fortune teller at a comic con. The Bath Fitter booth. Photo by Kendall Whitehouse. But most perplexing was the booth for bathroom remodeler Bath Fitter – complete with tub and shower surround on display. It’s difficult to see the market overlap between people looking to remodel their bathroom and the costumed superheroes and zombies who roamed the show. And, indeed, while the Superman-themed Norton/Symantec exhibit had a steady stream of people lined up to view the display, the Bath Fitter booth showed little evidence of activity. Yet, the trend to ride the rising wave of geek chic shows little signs of slowing. Nerd culture is no longer purely the domain of the young and socially-challenged. The crowd at the con included people of all types and ages — young and old; adults, children and families. What was once a market niche is becoming mainstream. And where audiences go, business follows — and that includes comic cons, whether or not the business can claim any direct relation to popular culture.